The final volume of the Belgariad has begun. The dark god Torak stirs in the east and Garion travels with the sorcerer Belgarath and the thief Silk to confront him. But standing between him and the god lies the lands of his followers, the Agerzaks. In the south, Garion’s fiancee, acting in his name, leads the army she’s raised to distract the Agerzaks. She will keep the world’s attention on her to give her fiancee the chance to slip through and defeat the dark god once and for all. Danger swells for everyone. War has come to the West while Garion and his small group has to dodge trackers, demons, and Grolim priests eager for new sacrifices for their altars. Two prophecies hurtle towards each other and their titanic conclusion. Enchanters End Game brings all the story threads together. The book is epic, bouncing around most of the world, seeing the impact of the impending war. Last book was Garion’s coming into adulthood and responsibility, and now Ce’Nedra has her own lessons to learn. War isn’t a game. It’s deadly and serious, and those she cares for will suffer for the decisions she makes. Garion’s arc is much… simpler. He has already reached the pinnacle of his character growth is nearly over. He’s made his choice in the last book, now he’s marching towards his fate, facing the fear and dread as he comes closer and closer. His final lesson is a profound one, though. 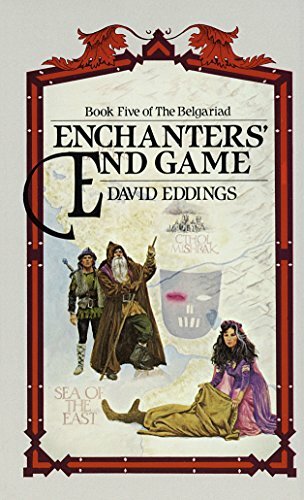 Eddings does a phenomenal job bringing this series to a close satisfactory. I particularly enjoy his epilogue and the efficiency of which he gives all the characters their codas without bogging the narrative down with scene after scene by using a dream as a framing device, allowing him to spend a few paragraphs sketching out the important details and flowing onto the next. The only complaint I have is how little Garion we get in this with half the novel devoted to the war. I also would have wished him to have a more active role in the decisions. Eddings had him grow up into a man, ruling Riva and making decisions only to have him surrender to Belgarath and Silk again. I can see why, but it would have been nice for him to be more in command as our hero. There are a few loose threads which Eddings uses to take us into a second series. He must have been thinking about the Mallorean because there is enough seeds planted to make the second series mostly work without having to do any major retconning of the ending (this is billed as THE final battle, but there’s an extra round still to come). All in all, the Belgariad was an amazing experience. It’s always a pleasure to revisit Eddings in his prime. Fans of Fantasy, especially boys, will enjoy this series. You can purchase Enchanters End Game from Amazon!